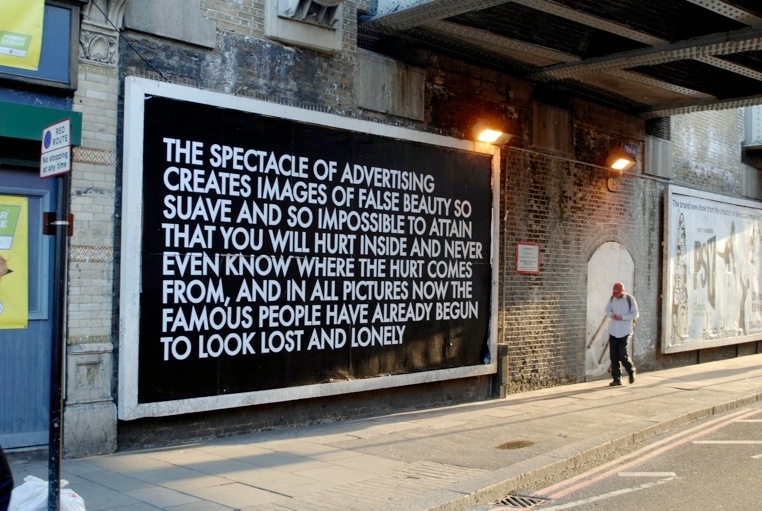 A good friend of mine Jason Eppink reminded me of Robert Montgomery's work this morning. I quickly realized I've never really posted on his billboard takeovers before, partially because I don't really know all that much about them. The image below is the most poignant for me but his other ruminations strike similar cords of melancholy and unobtainable commercial happiness. What she is suggesting is that by surrounding ourselves with certain forms of imagery and behavior, we normalize those activities and by doing so promote their continued existence and perseverance in our shared cultural behavior. In relation to smoking the detriments are obvious, but extended to other consumptive behaviors we can see how commercial media promotes excessive and egocentric actions. 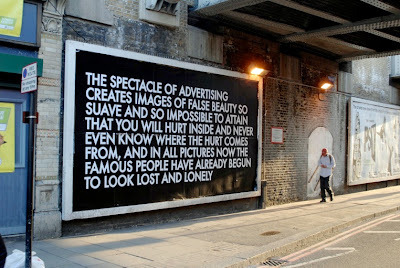 Those messages, so pervasive in all forms of media, also having access to public venues like billboards and sidewalk media infiltrate our society without an opportunity for escape. Robert Montgomery's work as a predominant form of imagery in public space would create an entirely different public persona. It would be interesting to imagine a commercial media force intent on creating all of the false desires necessary to propagate an ongoing conspicuous consumption machine, whose messages are counteracted by an alternate view presented in the public sphere. What if all of the magazine, television, internet, and alternative media ads were counteracted by a ubiquitous form of messaging that imitated Robert Montgomey's view point in public space? Your private ingestion would send one signal while your public consumption would send another entirely. How different would our society look if the media which we surrounded ourselves with in public promoted a public good, and one that denies the egocentric expectations of the commercial capitalist machine?